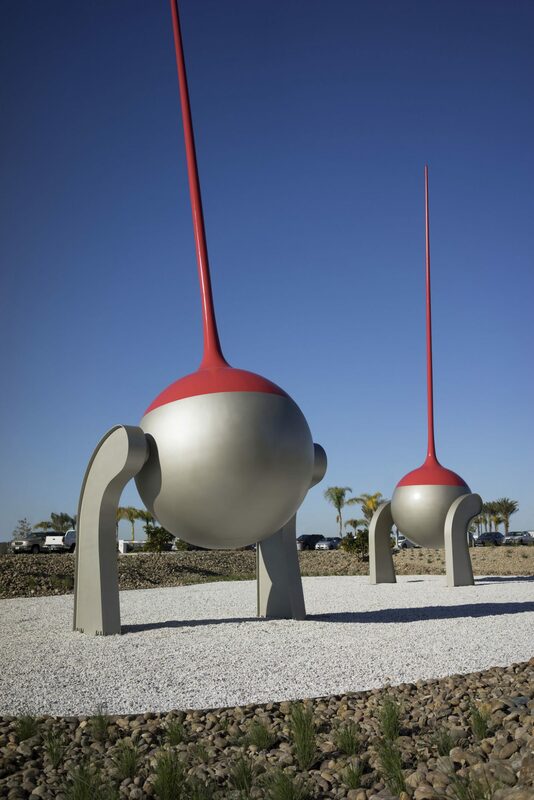 Located adjacent to busy roadways, the airfield, and San Diego Bay Christian Moeller’s MetroGnomes is uniquely situated at the intersection of many modes of transportation. The sense of constant motion that surrounds the site inspired the artist to create a work to reflect this busy hub of activity. Using an internal pivot mechanism developed by the oldest clock maker in Europe, the pair endlessly tick and tock in slow, graceful movements. The abstract form of the sculptures is evocative of varied objects, but for Moeller, it is most reminiscent of his childhood in Germany and the tradition of garden gnomes placed in front of yards.